So, I hired a babysitter today so I could go to yoga. I may be a little bit excited to have picked up my yoga practice again. I found a fab studio just a short 5 minute walk from home. When I practiced before, I never liked going any longer than one week between studio sessions. Since Phill is in Vietnam, I was at a loss. So, I hired a fabulous babysitter (I mean, if she can handle triplet boys, she can handle my two crazies). I left the kids in Christian’s capable hands and set off for my heated vinyasa class. First thing I noticed was that my instructor was American. So cool! Then, I hear her drop a “y’all.” Are you kidding me?! After class I stalked her and asked where she was from. Colorado, officially, but was born in Texas and lived in Fort Worth until she was 6! She was just as excited as I was to find a fellow Texan. I know to you fellow Texans this may not seem like a big deal. But when you are halfway around the world and in the minority of accents and culture, this is SUPER MAJOR. If that doesn’t impress you, this surely will. Last week I was at the park in the Corso when I heard a mom call out to her son “Austin” to slow down and watch out for the little ones, like Declan. I immediately noticed her Scottish accent. So I went over and asked her where she was from (even though I knew it was Scotland, you always have to ask). I was right! So, she’s from Scotland and has a boy Stella’s age named Austin. I told her my husband is Scottish and I have a nephew named Austin AND I’m from Austin, Texas. We chit chat about local preshcools (it’s a massive subject here because it is impossible to find a place anywhere) and then said our goodbyes. On our way home we ran into our friends that had just returned from 6 weeks back home in England and had a chat with them. We turned the corner onto our street and saw our Scottish friends. I asked her if she lived around here and she said, yes, in this building up ahead. I said, “no way, that’s where we live!” We get in the elevator and I asked what floor she’s on she says “7.” Us, too! I noticed she’s carrying pizza and we talk about how hard it is for me and Stella to eat pizza because we’re gluten free. She say, “oh, I know, I’m celiac.” Seriously?! So, so far, she is Scottish with a son named Austin, lives in our building, on our floor and is gluten free? It’s too much. As we are saying our good-byes Stella says bye to Austin and says to his mom, “wait, what’s your name?” Can you guess what she said? I kid you not. We were obviously meant to be friends. In other news we are busy gearing up to head home! I can’t believe we are on a plane in just a few days. I will have my feet back on Texas soil in one week. The kids have been insane and insanely cute, as always. Here’s a cute video of them in the bath tonight. 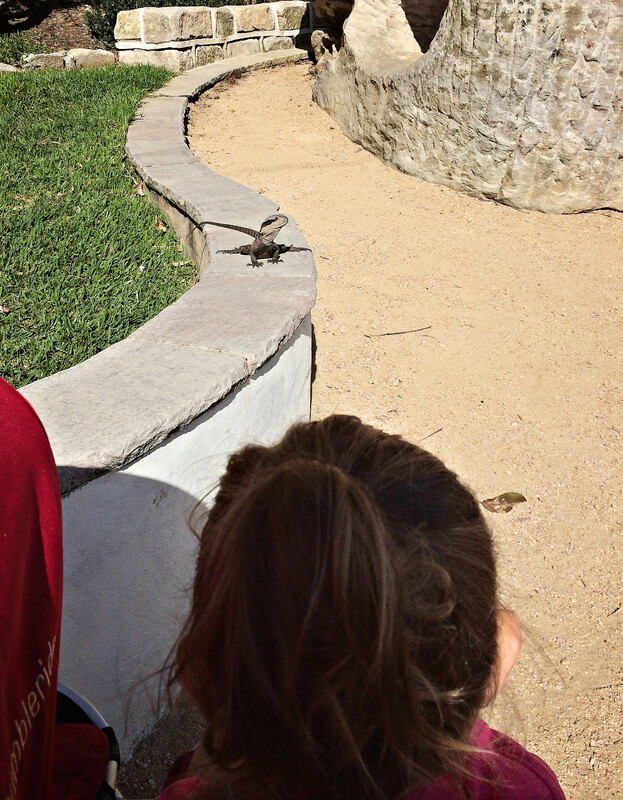 Tuesday we went out for our morning run and beach play and came across our new friend Walter the water dragon. The wild life here is, as you can imagine, vastly different than in Texas. Instead of deer crossing signs, we have kangaroo crossing signs. And koalas, and wombats. I smile every time I see one of those signs. I wonder if I’ll ever get used to it? 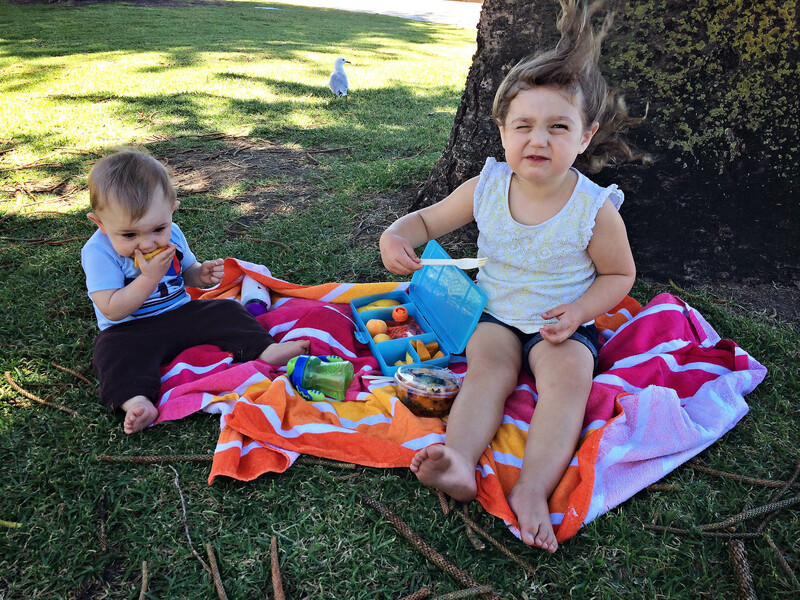 We attempted a picnic on Manly Beach this week. The beach was actually closed to swimming and surfing because of dangerous winds. We found this out exactly after our picnic. It was wildly windy! Later that day I took this picture of Declan. 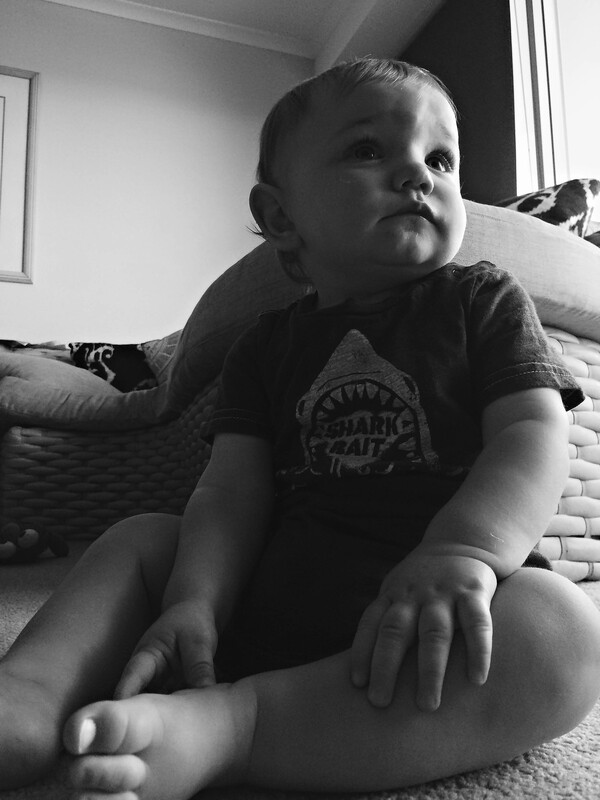 He looks a bit pensive, but mostly he just looks like his daddy. And now for a Stella pic. Seriously, she couldn’t be more Aussie in this pic. 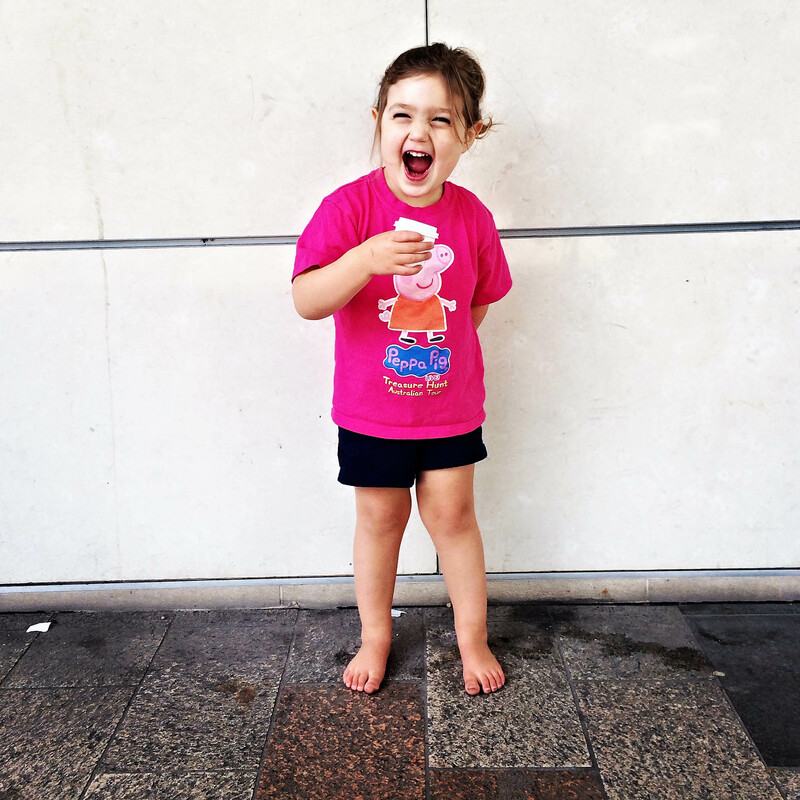 Barefoot with her babycino. The girl leads a charmed life, that’s for sure. In the midst of the past month, we celebrated Thanksgiving. 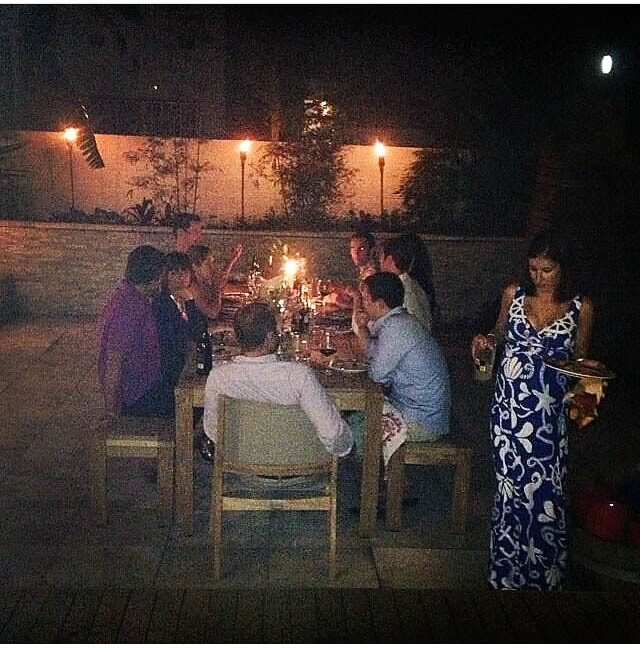 We were lucky enough to be invited by my American friend Katie to an adults only Thanksgiving dinner. It was gorgeous and lovely! We met some very nice folks and had a lovely evening drinking wine and eating delicious food. I had so much fun that I didn’t take any pictures! Here is one from Katie. Then, two days later we were enjoying another Thanksgiving feast at the Buntings. Friendsgiving, or Yanksgiving, was fab and had all the kids. It was Stella’s official Thanksgiving dinner and Declan’s first ever! It an odd feeling being so far away from home for Thanksgiving but I’m ever so grateful to the Phillips and the Buntings for making us feel so welcome and “at home” here in Oz. You may not hear from me for a bit as there are a lot of big things coming up! My birthday is Monday. I will be turning 34 which is nice since I’ve told everyone for the past 6 months that’s how old I am. Ha. We leave the next day for Hawaii. After two days in Honolulu, we are on a plane bound for Texas. Yeehaw! Once there we have heaps of things to do for the wedding and Christmas. I’m planning a trip to Dallas to visit my friend and her two boys (DALLAS FRIENDS: I HOPE TO SEE YOU WHILE THERE). I’ll try to post again soon. Until then, cheers! Love the “Emma” story! Hope you all have safe travels over the Christmas season!! !